This article contains underhood views of vacuum hose routing. Use these vacuum diagrams during the visual inspection portion of F -BASIC TESTING article in the ENGINE PERFORMANCE Section. This will assist in identifying improperly routed vacuum hoses which may cause driveability and/or computer-indicated malfunctions. Always refer to Emission Control Label in engine compartment before attempting service. If specifications in manual differ from label, always use emission label specifications. Fig. 1: Engine Vacuum Diagram (2.5L) Courtesy of Chrysler Corp. Fig. 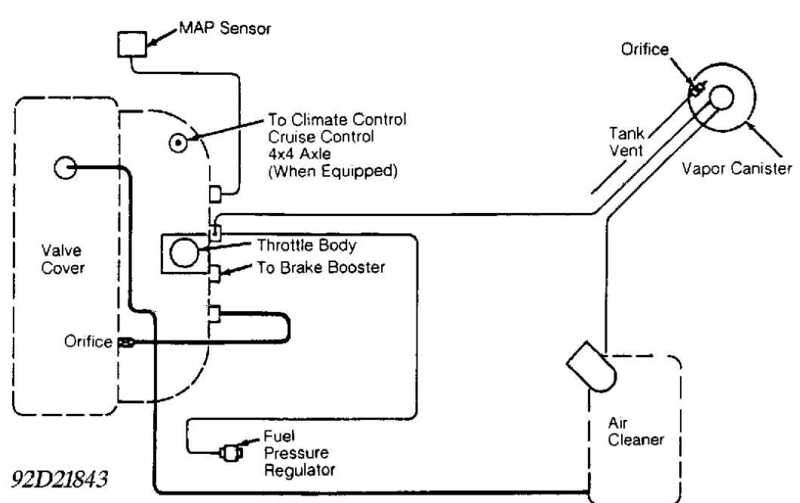 2: Engine Vacuum Diagram (4.0L) Courtesy of Chrysler Corp. Fig. 3: Engine Vacuum Diagram (5.2L) Courtesy of Chrysler Corp.